I've been a user and fan since the first Kindle was released in 2007, and have owned and used almost every version released but I wasn't going to demand that nothing change. Pagination can always be faster. Internet access can be stronger. There was room for improvement in weight and balance. I was actually looking forward to seeing what they would do. Let's start with features. It uses the same 300PPI six inch screen as the current Touch and Paperwhite eInk readers, but has 60% more LED backlights than the Paperwhite. This combination gives you laser quality print, and smoother backlighting than any previous Kindle. I have been using the Paperwhite for more than a year, and was very happy with it. The Oasis improves on the backlights so much that it is hard to describe. Previous complaints about uneven contrast and shading are a thing of the past. As with the previous eInk models, the Oasis has 4GB of RAM, allowing you to carry thousands of books with you everywhere. The one thing I would have liked in a device this far at the high end is either more storage or the ability to expand it via micro SD as can be done with the Fire tablets. While not many people have thousands of books in their digital libraries, some of us do after using the Kindle line for nearly a decade now. 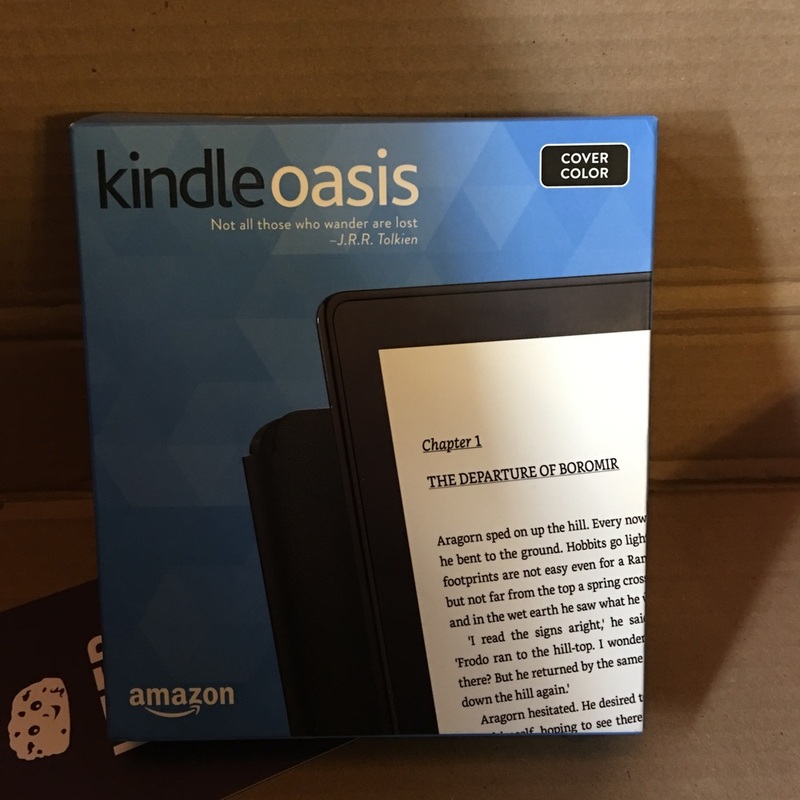 Weight and size are the places where Oasis blows the other readers in the Kindle range (and indeed most of the market) out of the water. The Paperwhite weighed in at 7.2-7.6 ounces depending on wireless options, and those weights were without adding any of Amazons cover options. The Voyage, even though it added premium ballistic glass to protect the screen reduced device weight by a full ounce to 6.2-6.4 ounces. Oasis weighs in at just 4.6 ounces. The Oasis is an inch shorter than either the Paperwhite or Voyage and while the side of Oasis where it is held and buttons are located is the same thickness, the area under the screen is almost a quarter inch thinner, reducing wrist fatigue while reading by shifting the majority of weight closest to the hand instead of having it across the entire device and thus having equal weight at the far edge feeling like it drags the device down. Battery life without the new charging cover is great, easily lasting through almost four full length novels with the backlight set at 10/50. I've had it almost 2 weeks at this point, so am not even close to draining the battery in the cover that Amazon rates at 6-8 weeks of daily reading (which they admit is based on 30 minutes a day, far less than I read). 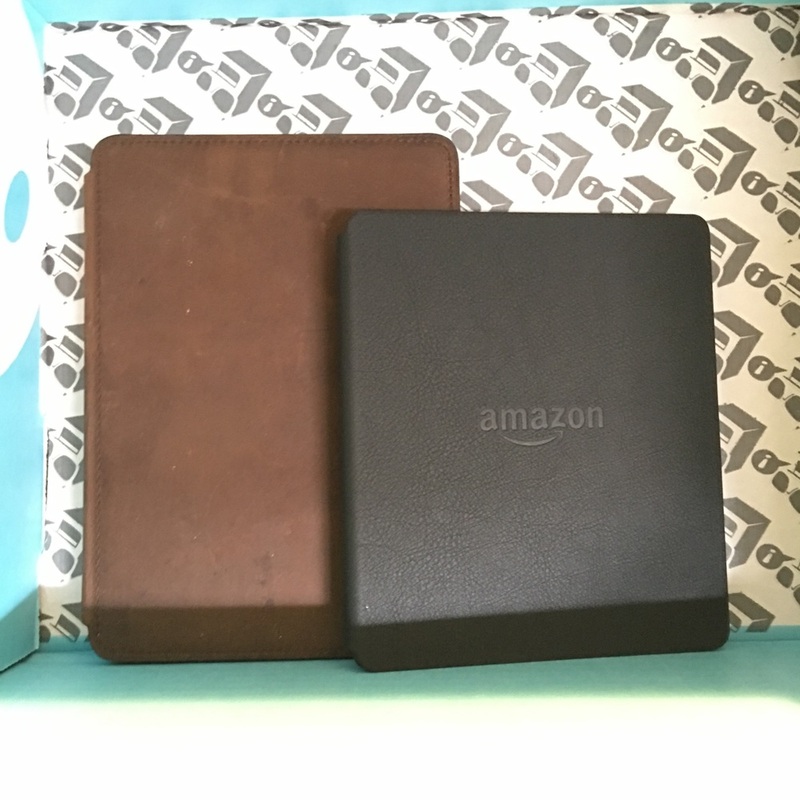 The price is a bit high, especially given the price points of the other devices in the line, but this really is the best Kindle Amazon has made yet. I love having a wide grip to hold onto, reminiscent of the spine of a book, and button placement feels easy and natural for one handed reading while walking riding public transit and needing to hold onto a hand grip. Having the weight focused closer to the hand makes extended reading less fatiguing, and makes reading longer far easier than you would expect it to make so big a difference. The backlights as I've already mentioned make low light reading no challenge at all for the eyes, and as always the screen performs exceptionally outdoors in direct sunlight. If it was priced more in line with the other dedicated readers in the line it would be a no brainier to upgrade, but this price is going to give some readers pause, especially when the Paperwhite is currently available for $120. That being said, now that I have it I'm not giving my Oasis up.